There is so much frenetic construction activity along Queen’s Quay on the way to The Power Plant. What’s going on? 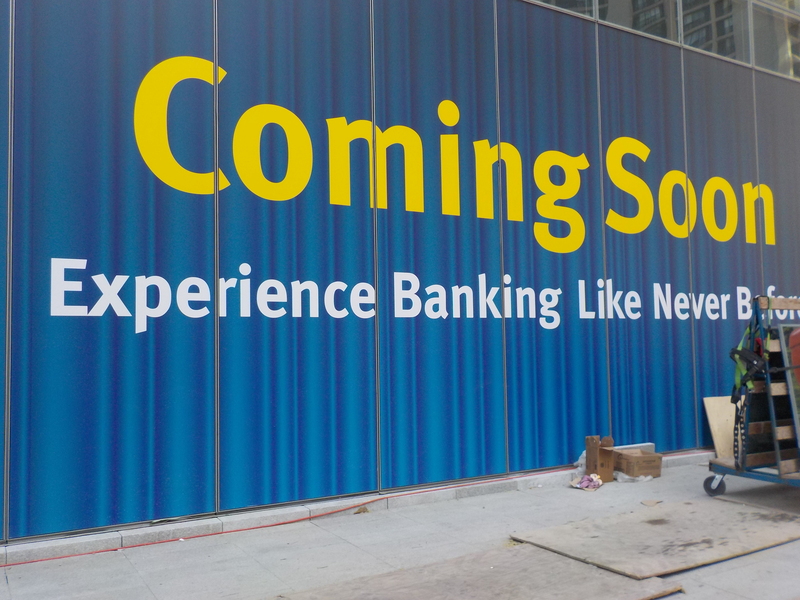 It appears RBC’s marketing team are working overtime to hint about what might be in store for us when all this commotion is done and the dust settles. 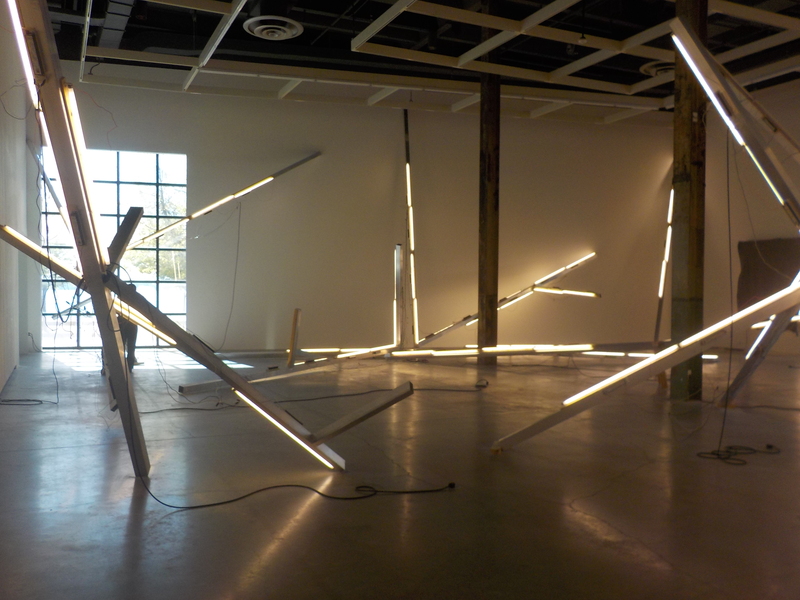 The fall season at The Power Plant includes impressive work by three artists. 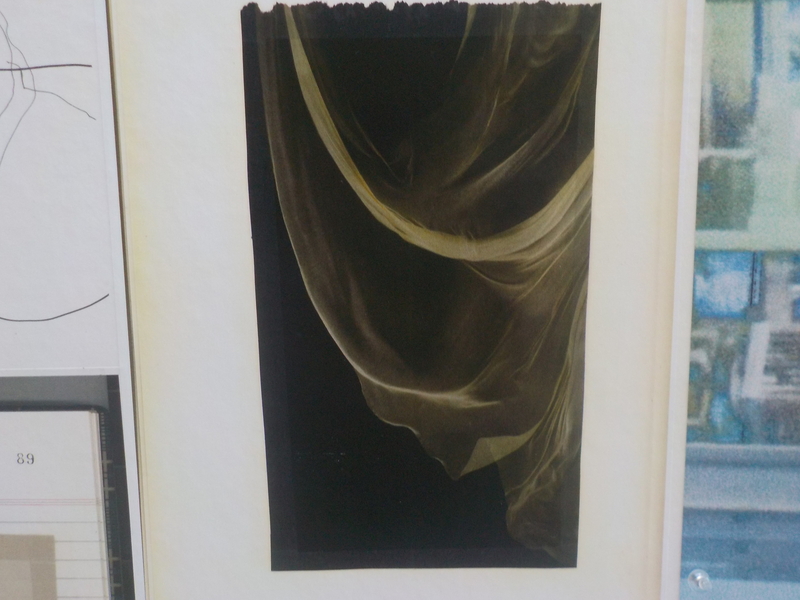 I admired Shelagh Keeley’s drawings back on September 6th at Paul Petro Contemporary Art. 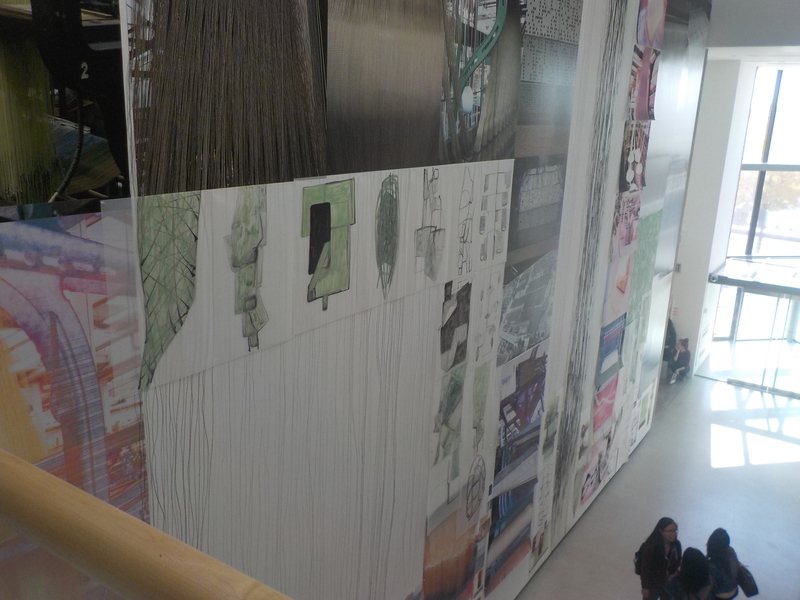 Here, covering The Power Plant’s vast clerestory wall, is an example of the artist’s site specific work, scaled up. 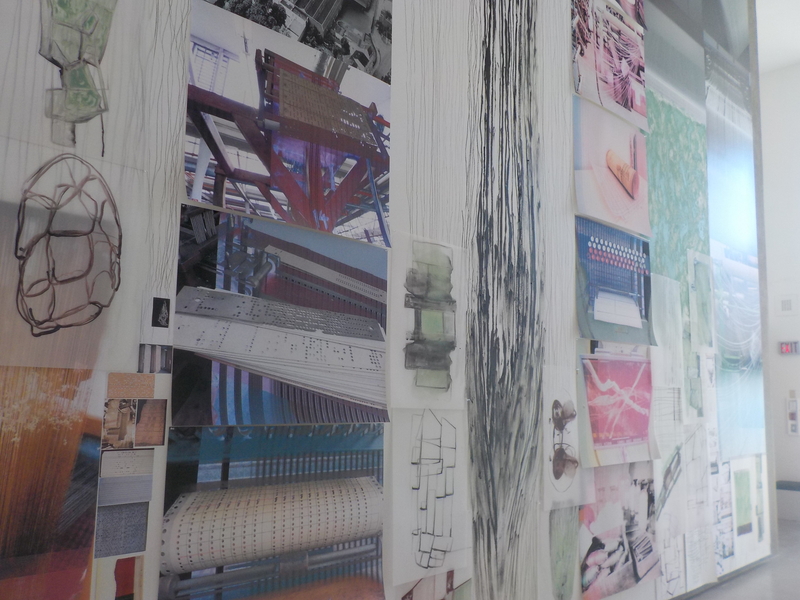 The piece is called “Notes on Obsolescence.” It has the spontaneity of jottings and doodles pinned up on a giant push-pin board but, amazingly, the numerous drawings, photographs and writings coalesce to create one monumental work of art. 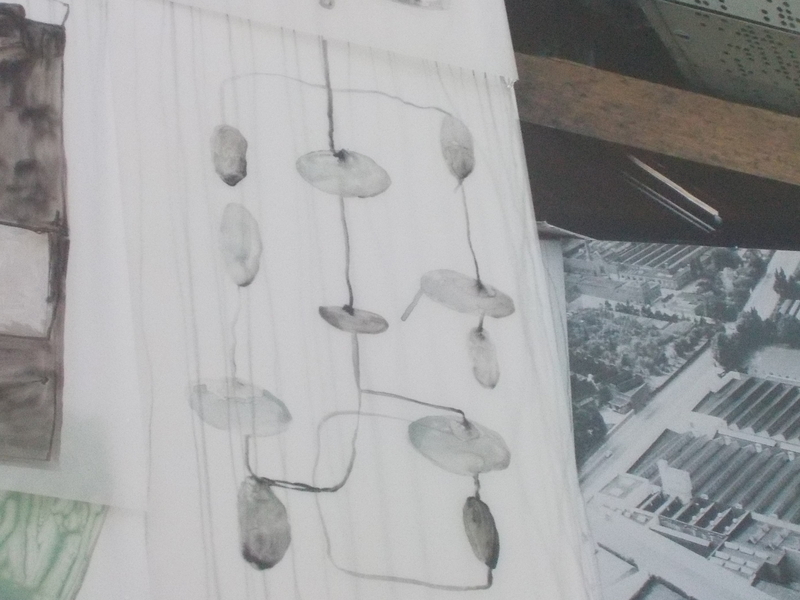 Threads, strings and strands – sometimes drawn directly on the wall – drop, dip and fall in concert with layers of more drawings and many photos (of different textures, hues, vintage and size) depicting spindles, shuttles, punchcards, servers, circuit boards, weavings, intersecting woofs and warps, dye mechanisms, the factory floor, gadgets and widgets, quotes from Marshall McLuhan, cascading reams of paper from a long gone dot matrix printer and so on and on. 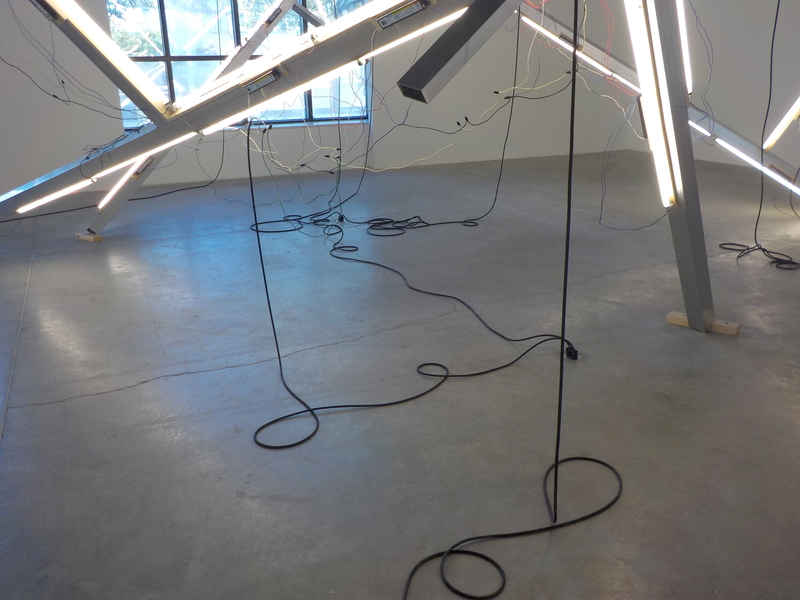 The work follows the relentless march of technological innovation by looking backward at the abandoned remains. 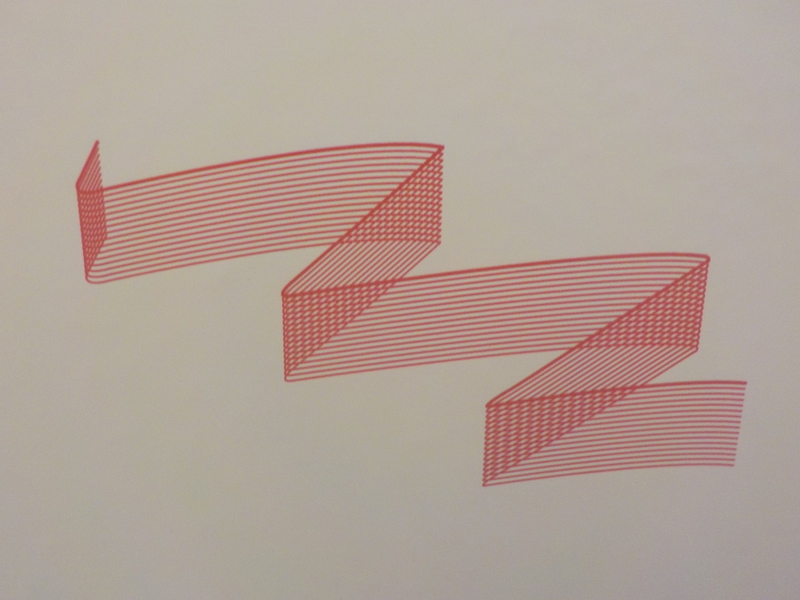 This piece is endlessly fascinating to look at. There is so much rich content and beautiful details. It was annoying that I could not see the loftiest sections until I realized I could simply walk upstairs. Seeing this sculpture by Julia Dault got me thinking: What if I owned an austere modernist rectangular house? What if I placed this sizzling pink and blue bundle in one of its large imposing rooms? How cool and sophisticated would I be? Would I have to hire a staff just to dust my possessions? Maybe its the playful colors and unconventional materials but I definitely got a sense of joy seeing this work. 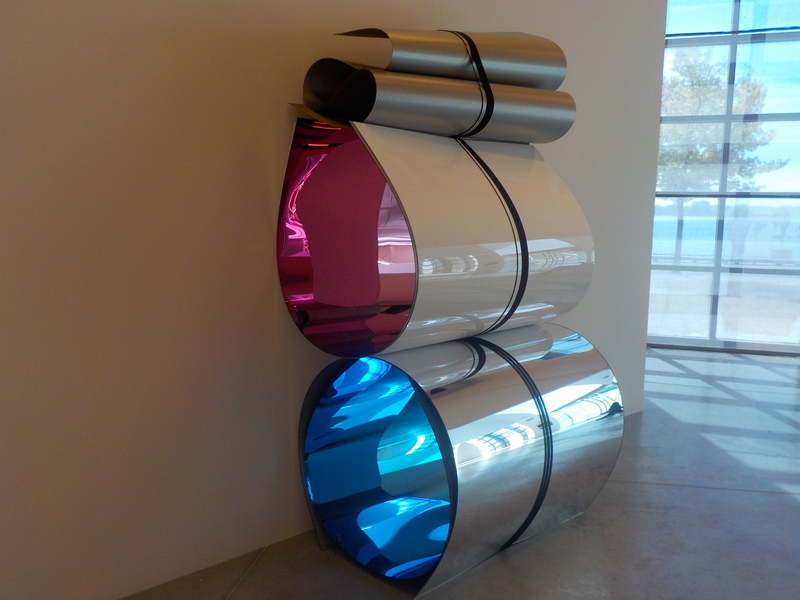 The high gloss sculpture appear on the verge of flying apart and the paintings have a late-night, rock ‘n roll high spiritedness to them. 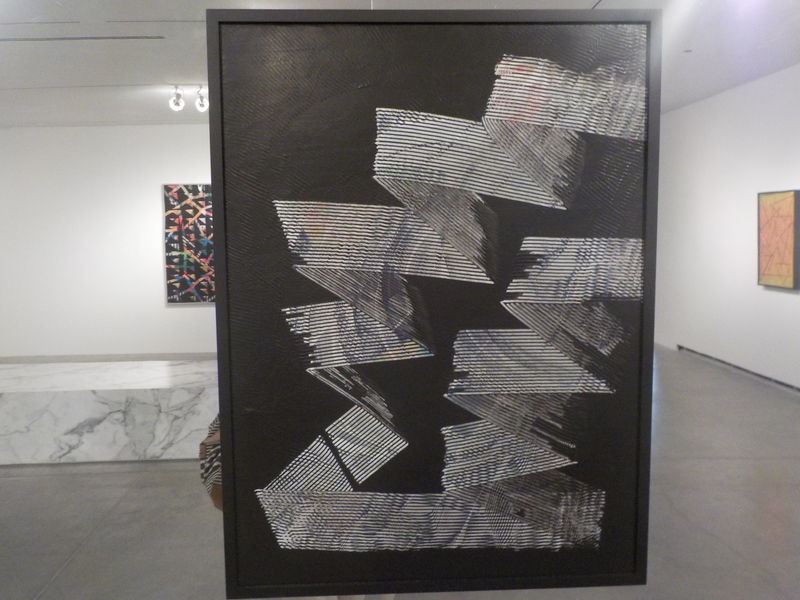 Julia Dault’s exploration into mark making is deep. 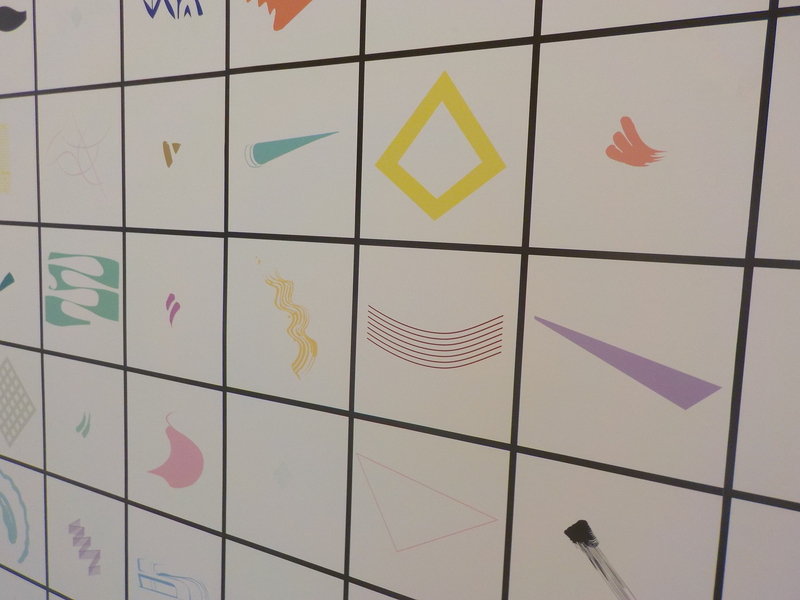 At the same time it has a certain infectious giddyness most evident in the sprawling lexicon of marks, encased in a grid, which she created for one wall of the gallery. 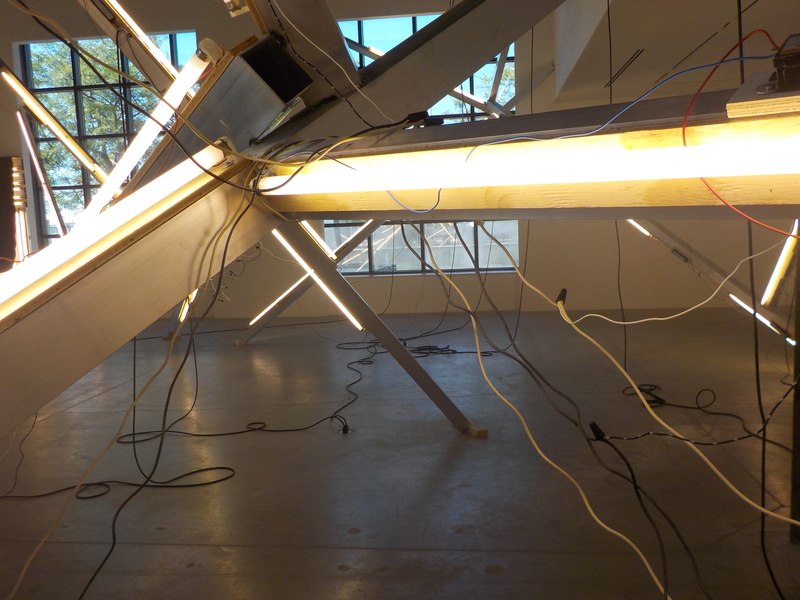 It has a dangerous feel too: through the precariously balanced beams, sharp metal edges, vulnerable neon tubing and tangles of explosed wiring. Wandering through this huge installation reminded me of my walk through the construction site to get here. I really enjoyed the bold, massiveness of it as the lake sparkled outside in the morning light; and there seemed to be emotional content too but it was not out of control, instead it was more like thinking about havoc in a repressed, distant and thoughtful way. That same contemplative feel is evident upstairs in a gallery containing fourteen paintings by Pedro Cabrita Reis. 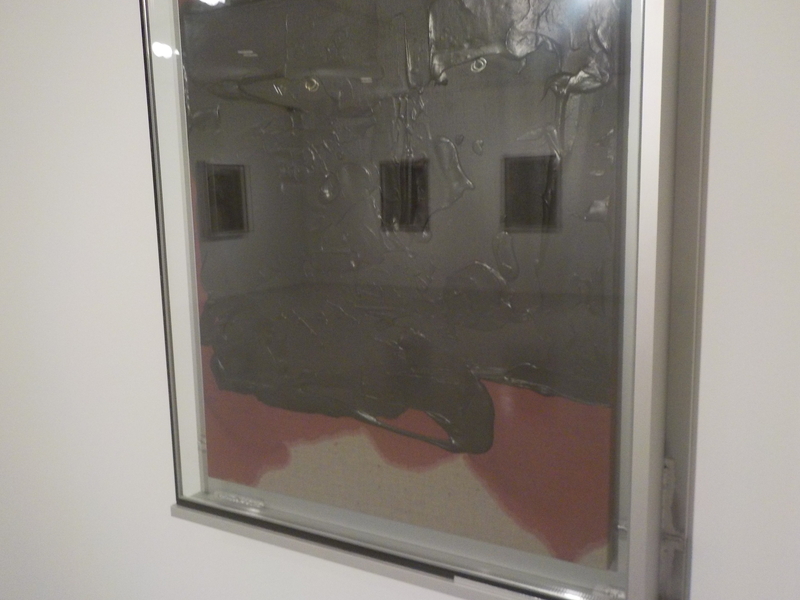 These formalist paintings are very somber: Raw canvas, reddish stain, heavy slablike layer of dark brown nearly black paint encased in elaborate plexi and welded metal frames.